As reported in “Harnessing Postdoc STEM Talent to Strengthen Illinois’ Innovation Ecosystem,” October 2015 ISTC Catalyst Newsletter. Where do postdocs go? Everywhere! It is important to be prepared to enter diverse career paths and be aware of opportunities that await you. To help get started, you’re invited to a special two part workshop presented by RA Capital and hosted by the Leadership Institute at Argonne National Lab. The workshops will cover job seeker strategies in the private sector and introduce you to RA Capital’s scientific approach to investing. RA Capital Management is a crossover fund manager dedicated to evidence based investing in public and private healthcare and life science companies that are developing drugs, medical devices, and diagnostics. RA Capital researches high interest therapeutic areas and identifies all the relevant technologies on the market or in development, and uses this understanding of a competitive landscape to produce a vision of how the market will likely unfold, determine how companies are positioned to perform, and convey relevance of data to our investment team. Target Audience: Postdoctoral researchers, Fellows, Graduate Students are welcome to attend. In addition, mentors and supervisors who seek to improve their skills in advising mentees in the job search and career exploration are invited to attend. 11:00 AM to Noon: Job Seeker Strategies in the Private Sector. Please Register Here to confirm your attendance. Attendees external to Argonne will be asked to complete a visitor request form to process site access. About the Speakers: Stephanie Moore, Director of Human Resources, RA Capital Management Stephanie Moore is the Director of Human Resources at RA Capital Management, a crossover fund manager dedicated to evidence based investing in healthcare and life science companies. Her responsibilities include talent assessment and acquisition as well as managing organizational growth and development. Prior to joining RA Capital, Stephanie led recruiting efforts at Aileron Therapeutics and was a Principal at J. Robert Scott Executive Search. She earned her Masters degree from the University of Rochester and Bachelors degree from Boise State University. Agustín Mohedas, PhD, Associate, RA Capital Management Agustín Mohedas is an Associate at RA Capital Management, a crossover fund manager dedicated to evidence based investing in healthcare and life science companies. He conducts research and analysis of drugs and medical devices for diseases, including Hepatitis B and Hepatitis C, and for capabilities such as antibiotics and vaccines. He holds a BS in Biomedical Engineering from Texas A&M University and a PhD in Medical Engineering and Medical Physics from Harvard/MIT. In his graduate research, he developed small molecule compounds to treat the rare genetic disorder fibrodysplasia ossificans progressive. Kristene “Tina” Henne is Argonne’s Postdoctoral Program Lead for the Argonne Leadership Institute. 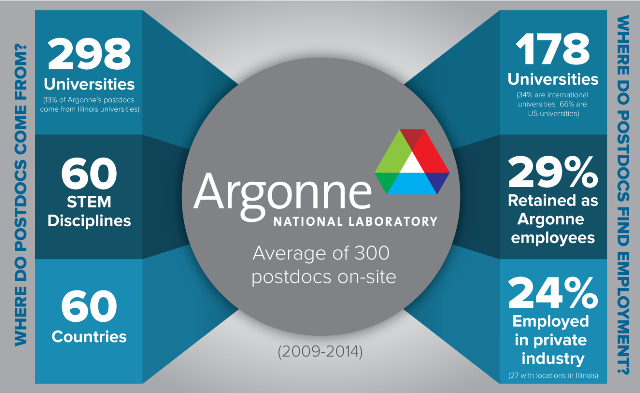 In this role, she facilitates the postdoc appointment process, postdoc career development, mentoring, advises the Postdoctoral Society of Argonne and serves as a navigator for postdoctoral issues. Henne has a Ph.D. in biological sciences from Purdue University, a B.S. in biology from Governors State University, and an A.A.S. in radiography from Kankakee Community College. She came to Argonne as a postdoctoral researcher in the Biosciences Division in 2009 and became a program coordinator in 2011. This entry was posted in Announcements, Career Corner, Events. Bookmark the permalink.